ABSTRACT. It remains unclear whether preemptive transplantation is beneficial, and if so, who benefits. A total of 38,836 first, kidney-only transplants between 1995 and 1998 were retrospectively studied. A surprising 39% of preemptive transplants were from cadaver donors, and the proportions of cadaver donor transplants that were preemptive changed little, from 7.3% in 1995 to 7.7% in 1998. Preemptive transplants using cadaver donors were more likely among recipients aged 0 to 17 yr versus 18 to 29 yr (odds ratio [OR], 2.48; 95% confidence interval [CI], 1.94 to 3.17), white versus black (OR, 2.33; 95% CI, 2.03 to 2.68), able to work versus unable to work (OR, 1.42; 95% CI, 1.26 to 1.61), covered by private insurance versus Medicare (OR, 4.77; 95% CI, 4.26 to 5.32), or recipients with a college degree versus no college degree (OR, 1.34; 95% CI, 1.17 to 1.54). Preemptive transplants were less likely for Hispanics versus non-Hispanics (OR, 0.57; 95% CI, 0.50 to 0.67), patients with type 2 versus type 1 diabetes (OR, 0.76; 95% CI, 0.61 to 0.96), and for 2 to 5 HLA mismatches compared with 0 HLA mismatches (OR range, 0.77 to 0.82). In adjusted Cox proportional hazards analysis, the relative risk of graft failure for preemptive transplantation was 0.75 (0.67 to 0.84) among 25,758 cadaver donor transplants and 0.73 (0.64 to 0.83) among 13,078 living donor transplants, compared with patients who received a transplant after already being on dialysis. Preemptive transplantation was associated with a reduced risk of death: 0.84 (0.72 to 0.99) for cadaver donor transplants and 0.69 (0.56 to 0.85) for living donor transplants. Thus, preemptive transplantation, which is associated with improved patient and graft survival, is less common among racial minorities, those who have less education, and those who must rely on Medicare for primary payment. Alterations in the payment system, emphasis on early referral, and changes in cadaver kidney allocation could increase the number of patients who benefit from preemptive transplantation. Preemptive kidney transplantation is carried out before the initiation of chronic maintenance dialysis. There are some theoretical detriments to preemptive transplantation. These include the failure to maximize the use of native kidney function and the failure to take advantage of putative immunosuppressive effects of uremia (1), which could theoretically help prevent early posttransplant rejection. In addition, it has been suggested that adherence to immunosuppressive medications after transplantation may be reduced if patients do not first experience the morbidity of dialysis. However, there are also potential benefits to preemptive transplantation. These include the avoidance of morbidity associated with dialysis and dialysis access procedures, as well as reduced cost. It has also been shown that transplantation is associated with lower mortality compared with dialysis (2); therefore, preemptive transplantation could reduce mortality by reducing time spent on dialysis. Some retrospective studies (3–7) from individual transplant centers have reported that preemptive transplantation has little effect on outcomes, but others (8–10) have reported improved graft survival. The North American Pediatric Renal Transplant Cooperative Study group (11) reported that graft survival is improved for children receiving preemptive transplants compared with children receiving transplants after initiating chronic maintenance dialysis. A study of 8481 adult, living-donor transplants from 1994 to 1997 (12) also reported a 52% reduction in the risk of graft failure associated with preemptive transplantation. However, in the European Dialysis and Transplantation Association-European Renal Association registry study (13) of 35,511 adult, cadaver and living donor transplants from 1985 to 1992, 5-yr patient and graft survival rates were not affected by preemptive transplantation. These differences in results could be due to differences in the populations studied, e.g., donor source (cadaver versus living), recipient age (children versus adults), level of kidney function at transplant, or transplant era. We undertook an analysis of United Network for Organ Sharing (UNOS) and United States Renal Data System (USRDS) data to examine the characteristics of patients who receive preemptive transplants, the effect of preemptive transplantation on outcomes, whether effects on outcomes are similar in both cadaver and living donor transplantation, and whether these effects are independent of recipient age, year of transplantation, and other factors. We studied patients who were included in the UNOS database and who received a kidney transplant during 1995 through 1998. These included adult and pediatric, cadaver and living donor transplants. There were 49,417 first kidney transplants, but 3582 with multiple organ transplants were excluded. Another 2365 were excluded due to missing information on the pretransplantation dialysis status. Thus, we analyzed 38,836 first, kidney-only transplants. Most of the data for these analyses were collected by UNOS; however, we also determined failure dates using data from the USRDS. We determined whether or not a kidney transplant was preemptive by using the response to the question of prior dialysis on the UNOS Transplant Registration Form. To compare patients who did or did not receive preemptive transplants, we evaluated several transplant recipient characteristics, including age at the time of transplantation, gender, race, ethnicity (Hispanic versus non-Hispanic), education level achieved, employment status, primary payer, cause of kidney failure, and human leukocyte antigen (HLA) mismatches. We defined graft failure as death with a functioning graft, return to dialysis, or retransplant. Separate analyses were carried out for recipients of cadaver and living donor transplants. We first examined associations between patient characteristics and preemptive transplantation, one variable at a time, assessing statistical significance with a χ2 test (categorical data) or t test (continuous data). On the basis of this univariate analysis, we selected variables that were associated with preemptive transplantation (P < 0.05) for inclusion in a stepwise, multivariate, logistic regression analysis. This analysis was designed to assess which of the patient characteristics were independently associated with preemptive transplantation. We also examined the effect of preemptive transplantation on graft and patient survival, using the Kaplan-Meier method with a log-rank test for statistical significance. We then assessed the extent to which the effects of preemptive transplantation on graft and patient survival were statistically independent of other variables using Cox proportional hazards analysis. All analyses were carried out using the statistical software package SAS version 8.1 (SAS Institute, Inc., Cary, NC). All results were considered statistically significant if P < 0.05. Overall, 13.2% of the 38,836 transplants were preemptive; 7.7% of the 25,758 cadaver donor transplants, and 24.0% of the 13,078 living donor transplants. Although most preemptive transplants were with living donors, 38.6% were with cadaver donors. The rate of preemptive transplantation was relatively constant over the 4-yr study period. The proportions of living-donor transplant recipients who received preemptive transplants were 23.4%, 23.6%, 24.4%, and 24.5% in 1995, 1996, 1997, and 1998, respectively. The respective proportions of cadaver-donor transplants that were preemptive were 7.3%, 7.9%, 7.7%, and 7.7% in these years. The proportions of cadaveric preemptive transplants that were 0-HLA mismatches were relatively small and constant over the period of study: 17%, 16%, 18%, and 19% in 1995, 1996, 1997, and 1998, respectively. Interestingly, the proportion of preemptive living donor transplants with 0-HLA mismatches declined, i.e., 21%, 19%, 13%, and 13% in 1995, 1996, 1997, and 1998, respectively. There were a number of characteristics associated with preemptive transplantation (Table 1). However, there were no differences related to the year of transplant, confirming that the rate of preemptive transplantation has remained unchanged in the 4 years spanning the study. Preemptive transplants were more likely among children, whites, non-Hispanics, patients able to work, patients with private insurance, and patients who had a college education. Having fewer HLA antigen mismatches was associated with a greater likelihood of preemptive transplantation, especially for recipients of cadaver donor transplants. Preemptive transplantation was associated with a lower rate of delayed graft function (dialysis in the first week after transplantation) compared with nonpreemptive transplantation, for both cadaver donor (8.4 versus 25.6%; P < 0.001) and living donor transplants (2.6 versus 6.1%; P < 0.001). In univariate (unadjusted) analysis, preemptive transplantation was associated with improved patient and graft survival for recipients of both cadaver and living donor allografts (Figures 1 and 2). In a multivariate Cox proportional hazards analysis, the beneficial effect of preemptive transplantation on graft survival was independent of other pretransplant characteristics (Table 2). In addition, preemptive transplantation correlated with graft survival, even after taking the potentially advantageous effects of less delayed graft function into account (Table 3). The reduction in risk for graft failure was similar among patients with graft survival >6 and >12 mo (Table 3), which suggests that preemptive transplantation affected the rate of late graft failure. Figure 1. 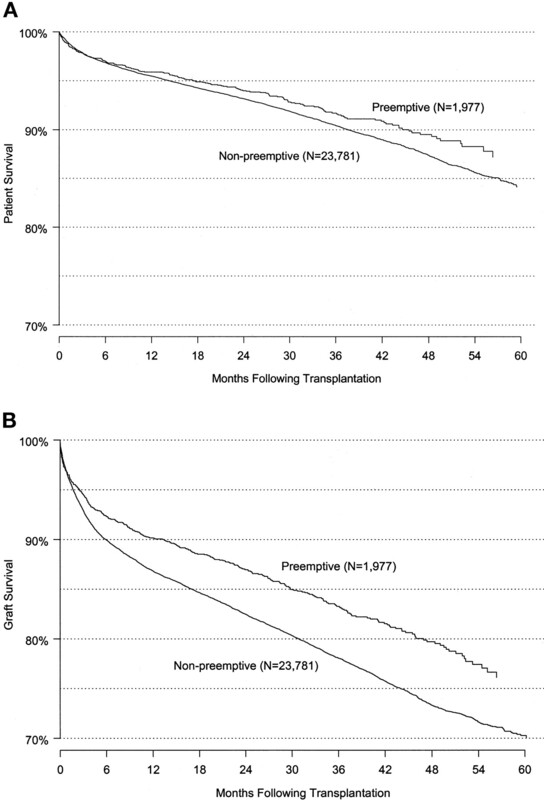 Relationship between preemptive transplantation and outcomes among recipients of cadaver donor kidney transplants. Shown are unadjusted, Kaplan-Meier patient survival (upper panel) and graft survival (lower panel). Figure 2. 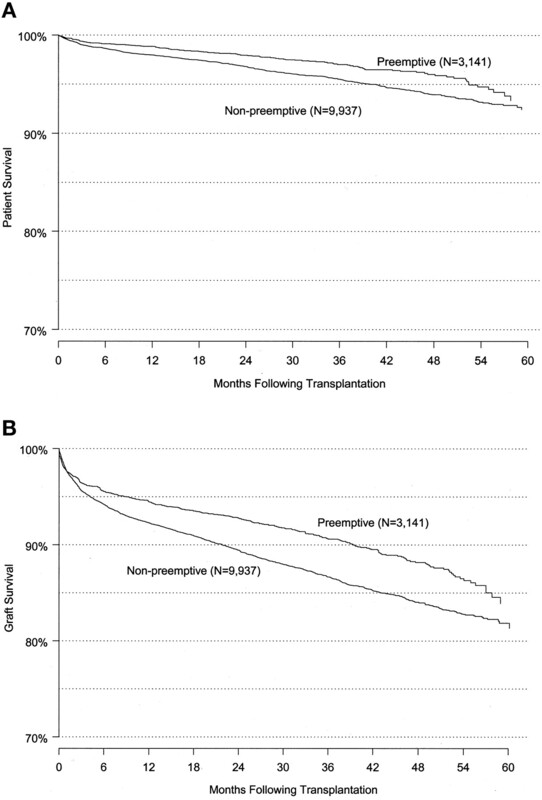 Relationship between preemptive transplantation and outcomes among recipients of living donor kidney transplants. Shown are unadjusted, Kaplan-Meier patient survival (upper panel) and graft survival (lower panel). In a multivariate, Cox proportional hazards analysis of cadaver donor transplants, preemptive transplantation was also associated with a reduction in the risk of death, after adjusting for the same risk factors shown in Table 2 (relative risk, 0.84 [0.71 to 0.99]; P = 0.034). Similar results were found for recipients of living donor transplants (relative risk for preemptive transplantation, 0.69 [0.56 to 0.85]; P = 0.001). In this study, we found that there was a greater likelihood of preemptive transplantation among patients who (1) had a living donor; (2) were younger than 18 yr; (3) were white; (4) were not Hispanic; (5) were better educated; (6) were working full time; (7) had a primary payer other than Medicare; and (8) had 0 to 1 HLA-antigen mismatches (Table 1). It is intuitively obvious that it is easier to receive a preemptive transplant if a living donor is available. In fact, it is somewhat surprising that as many preemptive transplants as we observed were carried out among recipients of cadaver kidneys, because the median waiting time for a first kidney transplant increased from 714 d for transplants in 1995 to 1016 d for transplants in 1998 (http://www.unos.org). Waiting times for cadaver kidneys are increasing; therefore, we were surprised to find that the rate of preemptive cadaver donor transplants has remained relatively constant. We hypothesized that the UNOS, 0-HLA mismatch, mandatory sharing policy, which went into effect March 6, 1995, reduced waiting times for some patients and thereby allowed them to receive a preemptive transplant. However, the proportion of preemptive transplants that had 0-HLA mismatches was less than 20%, suggesting that few patients received preemptive transplants as a result of this mandatory sharing program. In any case, it is encouraging that increasing waiting times have not further diminished the rate of preemptive transplantation. It is possible, however, that preemptive transplants will become less common among patients who do not have a living donor if waiting times continue to increase. This may be especially likely with the recent (effective January 19, 1998) UNOS requirement that estimated creatinine clearance must be less than 20 ml/min to begin accruing waiting time for a cadaver kidney. It is not surprising that preemptive transplantation was relatively more likely among children in this study, given that every effort is made to transplant children as soon as possible to improve their growth and development. Even so, among all cadaver donor-preemptive transplants, only 8.7% were to patients <18 yr old, and 3.3% of nonpreemptive transplants were to patients <18 yr old. Thus, giving children priority to encourage preemptive transplantation does not divert large numbers of cadaver donor kidneys from adults. It is not difficult to understand that patients who are not yet on dialysis may be better able to work full-time, because dialysis can make it difficult to maintain full-time employment. Indeed, another potential advantage of preemptive transplantation may be in allowing at least some individuals to continue to work. In a single-center study, patients who received preemptive transplants were more likely to be employed both before and after transplantation than patients who did not receive a preemptive transplant (3). Perhaps it should not be surprising that race, ethnicity, and education were each independently associated with preemptive transplantation. These socioeconomic factors pervasively influence access to health care in the United States. Correcting any inequities in preemptive transplantation will no doubt require substantial efforts on the part of all who care for patients with kidney disease, and especially those who refer patients for transplant evaluation. Furthermore, preemptive transplantation is only possible if patients are referred to nephrologists and transplant centers relatively early in the course of progressive renal disease. Studies have shown that early referral before the initiation of dialysis is associated with decreased morbidity for patients with end-stage renal disease (14–17), and the results of the present analysis suggest one way whereby early referral can lead to better outcomes. One of the strongest correlates to preemptive transplantation was the primary source of payment. Patients who had Medicare as the primary payer were much less likely to receive preemptive transplantation. Although having Medicare as the primary payer could be a surrogate for other socioeconomic factors, it is probable that the need to rely on Medicare itself discourages preemptive transplantation. Even though Medicare may eventually cover the cost of transplantation, the significant expenses that may be incurred before qualifying for Medicare may be prohibitive for many patients, especially the uninsured, who could otherwise be candidates for preemptive transplantation. It is possible that removing this disincentive would make preemptive transplantation more accessible, especially to individuals who cannot afford private insurance. Preemptive transplantation is clearly associated with improved patient and graft survival for recipients of both cadaver and living donor transplants. Indeed, preemptive transplantation was associated with 25% and 27% reductions in adjusted graft failure for cadaver and living donor transplants, respectively (Table 2). There were also 26% and 31% reductions in death attributable to preemptive transplantation for cadaver and living donor transplants, respectively. These improved outcomes were not just due to a reduction in delayed graft function or early graft failure. Indeed, after excluding cadaver donor recipients who did not survive with a functioning allograft for at least 6 mo, preemptive transplantation was still associated with a 19% reduction in graft failure (Table 3). Similarly, after excluding living donor recipients who did not survive at least 6 mo with a functioning allograft, preemptive transplantation was still associated with a 25% reduction in graft failure (Table 3). The reason for this additional, long-term benefit associated with preemptive transplantation is unclear, but it could be related to the avoidance of one or more comorbidities, e.g., cardiovascular disease, that may have otherwise developed during treatment with maintenance dialysis. It is possible that some of the of the benefit of preemptive transplantation is derived from the residual function of the native kidneys. Serum creatinine before transplantation was 7.0 (6.8 to 7.1) mg/dl (n = 1321) for preemptive cadaver recipients and 7.3 (7.2 to 7.4) mg/dl (n = 2418) for preemptive living donor transplants. These data suggest that most patients receiving preemptive transplants did not have much residual native kidney function. However, it is not possible to accurately compare differences in the amount of residual kidney function between preemptive and nonpreemptive transplant recipients, because residual kidney function was not reported for patients who were on dialysis at the time of transplantation. In any case, it would seem unlikely that persistent, residual, kidney function would directly explain the beneficial effects seen among those surviving for more than a year with a functioning allograft (Table 3). Longer follow-up will answer the question of how long the effect of preemptive transplantation on graft survival persists. Although preemptive transplantation is associated with less delayed graft function and better long-term patient and graft survival, these statistical associations between preemptive transplantation and improved outcomes do not prove cause and effect. Rather, the true effect of preemptive transplantation on outcomes could only be proven in randomized trials, and such trials are not likely to be conducted. In the absence of randomized trials, the use of multiple covariates to account for other differences in preemptive transplantation that could have a more direct effect on graft survival strengthens the case that preemptive transplantation is per se beneficial. Preemptive transplantation may also have advantages and disadvantages not addressed in the present study. Transplantation is ultimately less expensive than dialysis (18); therefore, avoiding dialysis altogether could help reduce overall costs. Preemptive transplantation may also obviate the cost and morbidity of placement of a permanent hemodialysis access. Because dialysis is often initiated in the hospital, preemptive transplantation could at least theoretically reduce the need for hospitalizations. However, there are also potential adverse effects of preemptive transplantation. It is possible that preemptive transplantation may increase the chances that patients who ultimately recover renal function may undergo transplantation unnecessarily. Although uncommon, at least some patients who begin dialysis for end-stage renal disease ultimately recover renal function (19,20). However, many patients are extremely unlikely to regain function, e.g., patients with hereditary renal disease or long-standing diabetes, and such patients may be suitable candidates for preemptive transplantation. In theory, preemptive transplantation may increase the demand for transplant donors by failing to maximize the use of native kidney function. On the other hand, to the extent that preemptive transplantation improves graft survival, the demand for donors for multiple transplants could diminish. In conclusion, the results of this study strongly suggest that preemptive transplantation is beneficial. However, the benefits of preemptive transplantation do not appear to be shared equally among transplant recipients. Thus, there are reasons to encourage preemptive transplantation through policy and practice changes, which also must ensure that preemptive transplantation is provided as equitably as possible to all socioeconomic and demographic groups. Portions of this work were presented at the American Society of Nephrology Annual Meeting, October 10 to 16, 2000, Toronto, Canada.